Even though he was 37 years old at the time and suffering from painful bone chips in his throwing elbow, Yankee catcher Elston Howard still managed to catch 113 games during the 1966 season. His batting average, however had dipped into the .250s and he had lost almost all of the pop in his once powerful bat. Concerned that their aging receiver would not last the season, the Yankees had made a trade in July of that year with Kansas City that brought the A’s one-time starting catcher, Bill Bryan to New York. Bryan, a native of Morgan, Georgia, had put together his best big league season the year before, establishing career highs with 15 home runs, 51 RBIs and a .251 batting average. The 6 foot 4 inch receiver then got off to a horrible start in 1966 and had lost his starting catching job in KC to Phil Roof. He was hitting just .132 when the Yankees traded for him in early June of that year. During his first three months in New York, he backed up Howard and Jake Gibbs, but by September, Elston was physically spent and Gibbs was injured so Bryan took over as the starter. He finished the year with a putrid .172 batting average but Yankee manager Ralph Houk decided to keep him around for another look the following year. That was probably because Bryan had shown some evidence that he could reach the old Stadium’s short right field porch with his left-handed swing. Houk’s second look only lasted a couple of months before Bryan was sent down to Syracuse in May of 1967. He played well in Triple A and was called back up to catch behind Gibbs, after New York traded Howard to the Red Sox that August. Ellie was only hitting .196 for New York at the time that deal was made. Believe it or not, that was almost 30 points higher than Bryan would average for New York in the 16 games he ended up playing in that year. The Yankees left Bryan exposed in the 1967 Rule 5 draft and he was selected by the Senators. He played his final big league season for Washington in 1968. He shares his birthday with this former Yankee pitcher and manager, this one-time Yankee pitching prospect and MLB’s former all-time saves leader. I have to admit that it has been harder for me to get excited about the Yankees’ “Killer B’s” pitching phee-noms than it has been for many more optimistic Yankee fans and pundits. Banuelos, Betances and (today’s Pinstripe Birthday Celebrant, Andrew) Brackman were being pointed to as the future of New York’s pitching staff last year at this time and I kept looking for hard evidence for those lofty expectations. Manny Banuelos is a southpaw, who has had some strong seasons as a starter during his first years in the lowest levels of the Yankees’ Minor League system but as he’s advanced upward, so has his ERA. He’s only 20-years-old, so Banuelos still has plenty of time to prove his supporters right. Dellin Betances is the 6’8″ right hander who is a native New Yorker. Yankee fans got a chance to see him start in that crazy 8-7 loss to Tampa Bay at the end of the 2011 season that took place on the same day the Orioles came from behind in the bottom of the ninth to knock the Red Sox out of the AL Wild Card lead. Girardi let Betances pitch just the first two innings of that game and he held the Rays scoreless. But like Banuelos, Betances success at the Minor League level happened early on, in the lowest levels. When he got his first opportunity to pitch for Triple A Scranton last year, he wasn’t what I would call overpowering, finishing with an 0-3 record and a 5.14 ERA in the four starts he made with the team. As unimpressive as the first two “B’s” have been recently, they’ve pitched better than Brackman, who is both the oldest (he turns 26 today) and the tallest (6’10”) of the trio. 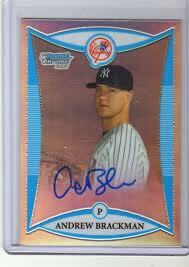 After pitching and playing basketball at North Carolina State, Brackman was the Yankees’ first round pick in the 2007 Amateur Draft. He had suffered a stress fracture of his hip during his second year in college but that did not prevent New York from giving the kid a three-and-a-half-million dollar bonus to sign with the team. Before the ink was dry on his new Yankee contract, the big right-hander’s pitching elbow started aching and it was discovered that he needed Tommy John surgery. He worked hard to come back from that operation going 10-11 during a split season in Single A and Double A ball in 2010. But last year, when he advanced to Scranton, he was just 3-6 with an ERA of 6.00. I knew things were trending downward for him when I read that the Yanks had Scranton experimenting with him in the closer role. He did receive the obligatory September call-up every multi-million dollar bonus baby gets, last year and got into three late-September games for New York. Brackman is supposed to have a fastball in the high nineties along with a knuckle curve and a good change-up. But he had a hard time getting any of them over the plate last season at Scranton, when he walked 75 batters in just 96 innings. With control issues that severe at this rather late stage of Brackman’s development, I was not surprised to learn last week that the Yankees had given up on him and declined his option for the 2012 season. The three Killer Bees have now become just a pair. 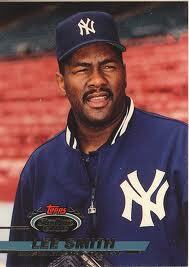 The first Yankee to pitch in the old Yankee Stadium shares Brackman’s December 3rd birthday. So does this one-time Yankee catcher and this former closer. It was a huge honor for CC Sabathia to be given the first ever start in the new Yankee Stadium in 2009. Although the Yankees and CC ended up losing the game to Cleveland, New York did go on to win their 27th World Series title during the new ballpark’s inaugural season. Eighty seven years ago, Bob Shawkey was given the honor of starting the first game ever in the old Yankee Stadium. Shawkey did better than Sabathia. He beat the Red Sox, 4-1 and the Yankees went on to win their very first World Series during their first year in their new stadium. 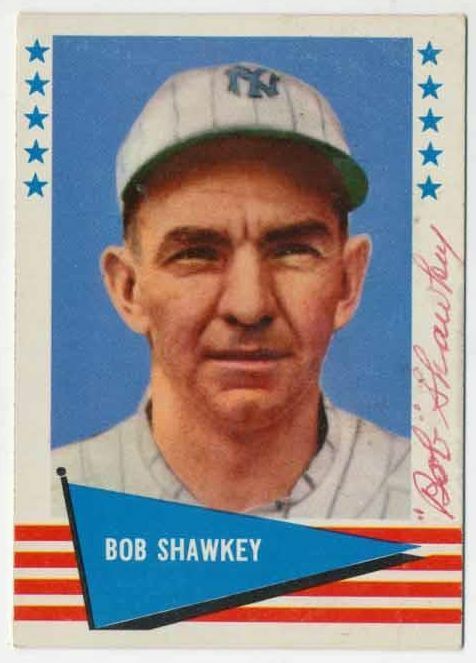 New York had purchased Shawkey from the Philadelphia Athletics midway through the 1915 season. The following year, the fast-balling right-hander broke out with a 24-14 record, the first of what would be four 20-victory seasons in pinstripes. His career was interrupted when he served in the Navy during WWI but when he returned from active duty in 1919, he started a streak of six consecutive seasons during which he won at least 16 games. He also pitched in four World Series for New York (and one with the A’s) but fared poorly, winning just one of three postseason decisions. After three consecutive losing seasons, Shawkey hung up his glove for good following the 1927 season. When Miller Huggins died suddenly during the 1929 season, the Yankees gave his managerial position to Shawkey. The 1930 Yankees went 86-68 in Shawkey’s first season at the helm but with five future Hall of Famers in the lineup and three more on the pitching staff, their third place finish wasn’t good enough for the team’s brass. Shawkey’s first year as Manager turned out to be his only year and he was replaced by the legendary Joe McCarthy. Shawkey was born December 4, 1890 in Sigel, PA. He died in 1980. Shawkey shares his December 4th birthday with the tallest of the three “Killer B” pitching prospects, this former Yankee catcherand this former closer who was once MLB’s all-time saves leader.